Eliot Lee HazelIf hype were actual currency, you could trade in copies of Scottish trio CHVRCHES’ debut album The Bones Of What You Believe for bars of gold, their buzz-versus-time graph having steadily grown over the last year, successfully buoying them through three North American tours of increasing stature and scale before their first full-length was in stores. These heightened expectations might seem to demand a big record, but those who were in attendance at the band’s first Toronto show in March – hardly a powerhouse live show with two-thirds of the band anchored to their keyboard stations and frontwoman Lauren Mayberry personable but not exactly owning the stage with her presence – can attest that it’s the small aspects of the band that give them their charm, an opinion borne out by Bones. The karaoke versions of these songs might easily be mistaken for M83 numbers, with their big synth textures and singalong melodies reaching unashamedly skywards, Mayberry’s sweet voice and the melancholic-to-miserable sentiments it delivers keeps things grounded and resonant at a human scale. It’s understandable if the lyrics aren’t the first things that the listener notices – the big gleaming hooks around them, both instrumental and vocal, do tend to grab one’s attention – but they do offer welcome substance to the proceedings and add an extra dimension that helps them exceed expectations. To be clear: even if Mayberry was singing nonsensical verses about squirrels and tapioca these songs would be earworms of the highest order, but that there’s heart and intelligence here as well makes Bones a record that will merit plays well after the hype machine has moved onto the next big thing. The Bones Of What You Believe is out this week on September 24 and NPR has a stream of the album. Consequence Of Sound, Billboard, The Wall Street Journal, and The Scotsman have features on the band and their ascent and CBC Music has a video session. The Independent gets to know Daughter, in town for a show at The Phoenix on September 29. MusicOmh talks to Johnny Flynn, who is streaming a new song from his forthcoming album Country Mile, hitting stores September 30. Yuck have released a new video from their forthcoming second record Glow & Behold, out September 30. Rolling Stone has made another song from the Neil Hasltead-fronted Black Hearted Brother available to download; their debut Stars Are Our Home comes out October 22. Under The Radar has posted the excerpts of the interview with Charli XCX that went into last issue’s cover story. She plays Wrongbar on November 9. The Fader is streaming a new song from London’s Arthur Beatrice – introduced back in July – taken from their full-length debut, due out early next year. Katie Harkin of Sky Larkin talks to DIY and The Yorkshire Evening Post about their new album Motto. The Guardian, Exclaim, The National Post, and Stereogum talk to Elvis Costello and The Roots about their just-released collaborative album Wise Up Ghost. Summer Camp takes The Quietus on a track-by-track tour of their new record Summer Camp. JAM and Pitchfork have feature interviews with Arctic Monkeys. The Wall Street Journal has a video session with Laura Marling, who has just released a new video from her latest album Once I Was An Eagle. Noisey, The Georgia Straight, and City Pages interview Savages. PopMatters talks to Tracyanne Campbell of Camera Obscura, who just gave birth to her first child. Congratulations! Metro finds out what Johnny Marr thinks of Queen. The Toronto Star caught up with Peter Hook before his visit to town last week. Berlin Beat talks to David Lewis Gedge of The Wedding Present. Typo – Daughter is September 29th at Phoenix, I think. Okkervil is 28th. 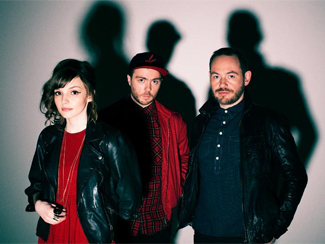 Caught Chvrches giddy, if brief, show last week and the excitement for them really took me by surprise. But they put on an impressive performance that yes, was reminiscent of M83 at times, but they bring their own personality to it, and Ms. Mayberry was quite engaging. They do seem to be enjoying themselves!